I was provided a copy of this book by YMAA Publication Center for the purposes of reading and reviewing the book. While it was provided to me at no cost, I am under no obligation to give a positive review. That said, go out and buy this book. Now. Unless you live in a bubble and never interact with others, which not likely the case if you’re reading this blog, you have the opportunity of interacting with others in a potentially violent way. Sure, do what you can to avoid circumstances, etc., but things happen despite our best laid plans. Presence – This can be a law enforcement, bouncer, security or other presence of authority, or it could simply be witnesses when the attacker doesn’t wish his actions to be seen. Sometimes it’s enough to de-escalate. In the case of social violence, where pecking order and ascension in a hierarchy require validation of actions, it’s actually enough to cause the violence to happen. Voice – Sometimes proper use of our voice is enough calm a situation. Other times the words you choose and how you say it (body language, facial expressions, rate, tone, volume, etc.) are enough to escalate the encounter. Touch – This can be anything from a girlfriend’s “It ain’t worth it, baby” light touch on a forearm to grabbing someone on their triceps to redirect or guide them. The point here is that it’s intended to be non-threatening, but it won’t always be interpreted that way. Empty-Hand Restraint – This is when you actually are using force to detain or control someone against their will. Less Than Lethal Force – Notice I didn’t say “non-lethal force”. The point of this level is intent. A punch to the stomach isn’t typically enough to rate as lethal force, but if the other person falls forward and hits his head on a table, killing him, guess what? That’s lethal force. This level could also include joint destructions, throws, etc. Lethal Force – Without a doubt, the absolute last resort in most cases. This is the application of force with the intent to kill. The authors go into much more detail of each level. They are also careful to express that the above is not a ladder. You don’t always move from one level to another in a direct progression. You may have to go straight from Level 2 (Voice) to Level 6 (Lethal Force), depending on the actions of your attacker(s). Or sometimes it fluctuates as tempers cool and then flare again. You have to be able to recognize the appropriate level of response and act. Miller and Kane also spend a lot of time talking about legalities related to the use of each level. While this is not meant to be construed as legal advice, it will definitely give you something to think about. There is even a break immediately preceding Level 4 where the authors are clear to point out that if you apply anything in Level 4 or 5, congratulations! You’ve just committed a crime. Sure, it may be justified, and you better hope you’ve got the attorney to prove it, but once you put make contact with the intent to harm someone, it’s a crime. Throughout the book are real-world examples provided by the authors, mostly of their own experiences in security or law enforcement, to help you understand the dynamics of each situation they are discussing. They are also very clear in helping the reader understand that everything they are talking about is still fuzzy in interpretation. What feels like the exact same scenario at different times could have completely different outcomes, even if you take the same course of action. That’s why you have to be able to adapt to the situation on the fly. Quickly. Overall, this is an outstanding reference for everyone, not just martial artists, bouncers, LEOs, etc. Everyone has the chance of finding themselves in a potentially violent encounter, and they certainly don’t want to have On The Job training, so to speak, if they can forewarn and educate themselves. This book was made available by YMAA Publication Center through NetGalley, and I requested a copy for the purposes of reading it and providing a review. OK, all the necessary stuff out of the way, how cool is it that you find a book you were willing to pay good money for available for review at no cost? Indeed. Life. Is. Sweet. 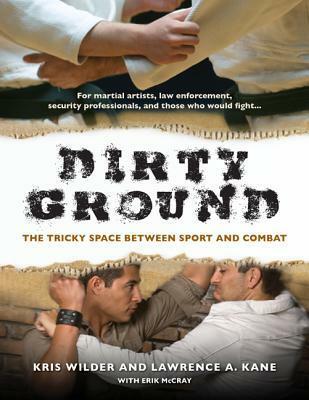 This book works off the premise that ground fighting, which is cool in the MMA ring or other competition arena, has to be played by different rules, or no rules at all, when it’s a violent encounter. Or, in the middle space between sport and combat, what the authors refer to as a “Drunkle”, the example being your drunk Uncle Albert at a family reunion. You’re asked to corral him and get him to settle down, but you can’t put the hammer down on him like Anderson Silva or use lethal force. He is, after all, family, like it or not. Ability – Is the threat able to hurt you? An armed teen with a knife certainly is. An unarmed toddler isn’t (unless they’re dropping Legos in the hallway, to be found in the middle of the night). Opportunity – Does the threat have the opportunity to hurt you? The same teen standing forty feet away with the knife wouldn’t have the opportunity. Once that teen gets within that magical 21 feet, he certainly does. Jeopardy – Are you in what a reasonable person would call jeopardy? Even if the armed teen is cussing and telling you he’s going to kill and describing in detail how he’s going to do it, if he’s walking away from you while doing so, you’re not in jeopardy. Preclusion – Did you, absolutely, have to fight and not have any escape avenues preceding or during the encounter? If a guy is in the car next to you waving a gun, telling you what he’s going to do to you, and you get out of your car and put a beat down on him, you may have the first three points on your side, but not the last. You could have avoided the encounter by simply putting pedal to metal. This is just an example of what the authors cover. They spend a great deal of time talking about what ifs and wherefores and whys of violent encounters, giving you many things to think about. While they rightfully stop short of giving legal advice, they do make sure you understand there is much more going on that what might be going on in your head. Also addressed briefly, but in a solid manner, is the difference between social and asocial violence. They also cover in detail some popular grappling styles through the centuries and how they fit into the sport, drunkle or combat spectrum. Finally, they show several judo techniques, not because of superiority of that art, but because of the accessibility of terminology because of the popularity of the art, and put each one into the sport, drunkle and combat spectrum, giving examples of how those techniques might be applied. They also provide pictures of each of these examples, demonstrating how the force applied in each would differ. Overall, I was very pleased with this book. It definitely covered the continuum I was hoping it would, speaking to the differences between each area, the gray areas in between, and how to tell which part of the continuum the encounter falls into. Not only that, but they also try to give you pointers on identifying when the encounter shifts from one area to the other, such as when drunk Uncle Albert suddenly has his three sober, armed brothers coming to his aid (my example, not theirs). 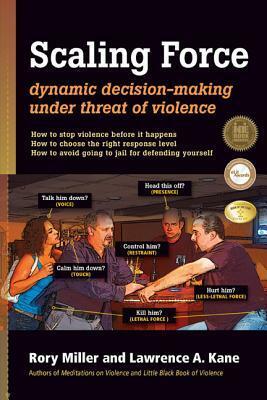 If you have any interest in protecting yourself and those you love in a violent encounter that could end up on the ground, this book is definitely for you.